The students LOVED learning about the wild and whimsical Andy Warhol. 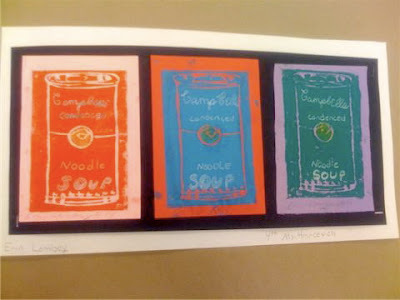 They were drawn to his soup cans from the beginning, so naturally when it was time for a printmaking project, that's where my mind went. The students added detail with prisma-colors. They ended up with either 2, 3 or 4 of their favorites. I liked doing it this way, because the products all turned out differently when matted and framed. What technique did u do to create this? I think my grade 4s would love it!! Did u create a stamp-like object? What materials did you use? Hello, I am a first year art teacher at a first year school. Which means unds are slim to none. Could you tell me how you made these prints? 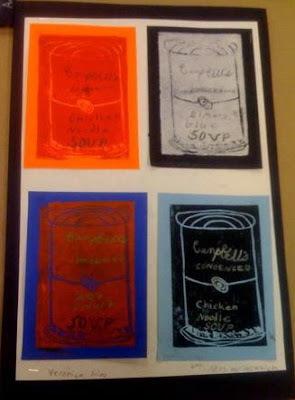 They are awesome renditions of Warhol. Thanks. I am really curious about how you did this too! Did you apply paint to the page and then draw details with prisma colors? 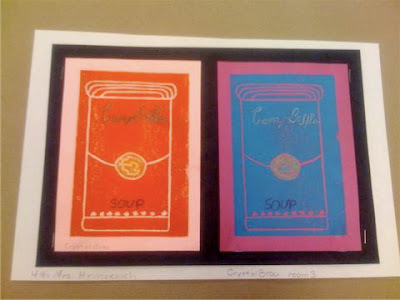 I am a huge warhol fan and I did a project with kindergarten class where they made "zebra" prints. Just wondering how you did this for future projects.